Three best-selling authors have come together to write a novel about three women united by one iconic New York City building and a ruby necklace. 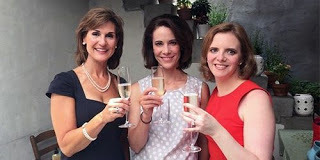 Over glasses of wine, these three authors decided it would be fun to write a novel together. Williams knew of an old mansion in Manhattan that was now being used as a private hospital. After a tour of the mansion, the three authors knew they had a story to tell. 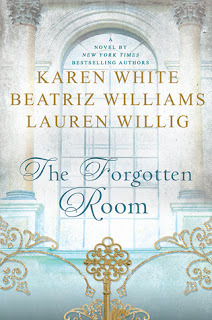 From three different generations, three women tell their story of lost love all while being connected to the same mansion. Each chapter tells the story of the women, alternating between them. Olive is a house-maid to the wealthy Pratt family who live in the mansion during the 1890’s. During the 1920’s, Lucy lives in the mansion, which is now a boarding house. Lucy works for the law firm that represents the Pratt family. She is trying to understand her family secrets and her connection to the Pratt family and hoping some files in the law firm will give her the answers she needs. Then in the 1940’s the mansion is turned into a hospital. Kate, a doctor in the hospital, heals soldiers coming home from the war. When an injured Captain arrives, she finds a painting of her in his personal items. She risks everything to find out where the painting came from and their connection to each other. 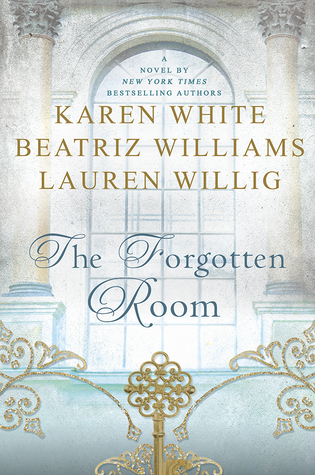 As the reader immerses themselves into lives of these three women, they will try to understand the connection between the three women over the last fifty years. The transitions between the characters and their stories are so seamless, you would never know it was written by three different authors. You would never know that as each author wrote for a bit, she would send her chapters along to the next one for them to read and continue writing. I was thankful I read this in a print copy because, in the beginning, I did flip back and forth reminding myself of the three women and their connection to the Pratt family. That’s not as easy to do when using an eReader. I loved the architectural detail describing the family mansion. The fact that it is based on a real mansion in Williams’ family makes it even more fascinating. Having the character of Kate be a doctor during a time when women weren’t supposed to be taking on traditionally male roles made her character even more interesting. The love interests in each of the women’s stories were passionate and romantic but not over-the-top. The reader would be rooting for them, even knowing their relationship was likely doomed from the start. This story is full of “what-if” situations and difficult choices loaded with heartbreak. Since you have to read through three chapters to get back to a character, you will want to keep reading to see what will happen next. These three authors are talented individually, but together they create a story that will remind you to follow your heart and not to lose sight of your dreams. I hadn’t seen or spoken to him. like the winter earth missed the sun.